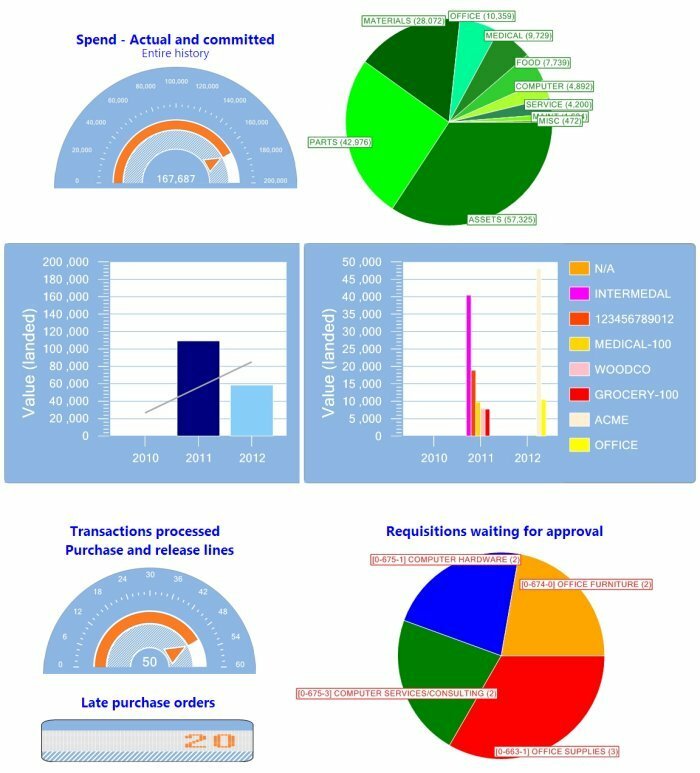 The information contained in SpendMap is one of your most powerful tools to help control spending and reduce costs. SpendMap makes it easy to get at your data with over 100 built-in reports, powerful Executive Dashboards, as well as easy-to-use status/inquiry screens. Executive Dashboards with more than 50 Key Performance Indicators (KPIs), to enable instantaneous and informed decisions to be made at a glance. Status & inquiry screens to look up specific information on-screen, such as the status of a user’s order, pricing history, the status of your budget, and so on. The purpose of a budget is to align spending with business strategic and financial objectives. However, in a manual environment (and even with most basic procurement systems), it is just not practical to compare individual expenditures against the budget at each decision point, since there is just too much labor involved. With SpendMap, it’s easy to compare expenditures to real-time budget data on-screen, when entering orders and/or at the time of approval. More importantly, budgets can be updated much earlier in the procurement process (e.g. when the initial Requisition is created, rather than weeks later when the supplier’s invoice shows up). With SpendMap, the procurement process can always be executed within the context of the budget to ensure that your spending is aligned with your corporate objectives. View budget status on-screen when entering Purchase Orders, approving Requisitions, etc. Real-time budget visibility without the effort – budgets are updated automatically as Requisitions, Purchase Orders, Invoices, and other transactions are processed in SpendMap. Optionally block/prohibit transactions that will exceed budget to stop unauthorized spending in its tracks or route over-budget Requisitions for additional/custom approvals. 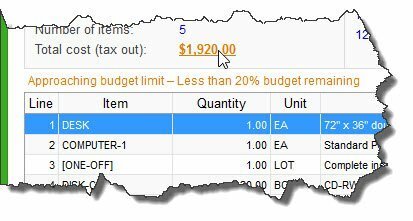 Cost Center and G/L level budgets – budgets can be assigned to each Cost Center (department, project, business unit, etc.) or at the G/L Account level within each cost center. Time-based and overall budgets – budgets can be established for up to 12 periods for “time-based” budgets (e.g. monthly, quarterly, annual, etc.) and/or for an “overall” budget for the cost center (i.e. independent of time, such as when tracking a Project budget). On a train. At the airport. Out of town. Orders don’t stop just because you’re away from your desk. 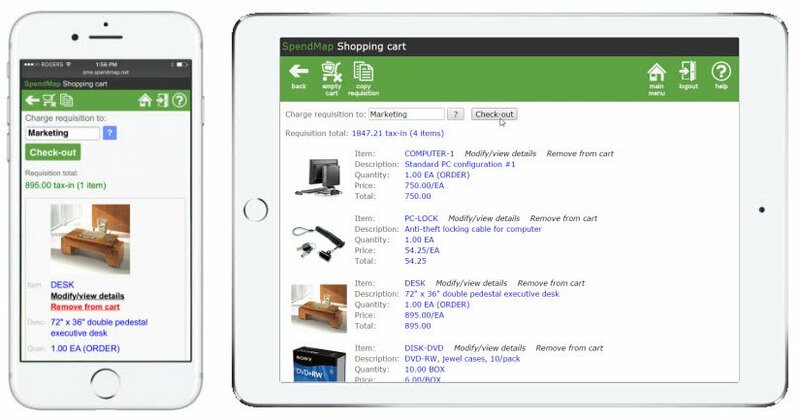 Bring the power and convenience of SpendMap to your Smartphone and Tablet. Approve requisitions on your phone. Request or receive items on your tablet. SpendMap’s mobile solutions are designed with ease-of-use in mind, so your team can use the system with little or no training at all, using any type of device. Since Purchasing is not an island in the organization, SpendMap includes flexible integration tools to share information with your other business systems. SpendMap comes with over 30 out-of-the-box integrations, including both “direct” integration with popular Accounting and ERP systems such as QuickBooks, Sage and Microsoft Dynamics, as well as flexible “batch/file” import and export utilities. SpendMap is extremely flexible and can be configured to meet your unique needs and reduce or even eliminate the need for custom programming. SpendMap offers built-in configuration options to change field names, determine document workflows, specify PO and other document number formatting, set up sales tax rules, and so on. To keep your valuable data safe and sound, SpendMap offers a variety of security tools, such as sophisticated password management options, user-definable menus to restrict users to only the areas of the system that you want them to see, as well as SSL, multi-level authentication, and other top-level security features to keep the bad guys at bay. Learning and implementing industry best practices can take a ton of time and effort. SpendMap can help you shorten the learning curve. Since we built SpendMap over the last 25 years based on input from thousands of Buyers, Purchasing Managers, CEOs and CFOs, implementing SpendMap will automatically give you Purchasing and Spend Management Best Practices. So there’s no need to start from scratch…you can learn from those who came before you. SpendMap understands the complexity and process of procurement at a deeper level than most. They could see 5 miles down the road where I couldn’t. Sure, your company is different. But that doesn’t mean that you have to give up on industry best practices. SpendMap is extremely flexible, with built-in configuration options for everything from how you want your PO form to look, to how you track your budgets, to the rules that you use to route your Requisitions for approval. And for our truly unique clients that have very special requirements, we’re happy to customize the system to your needs, such as a custom report, or perhaps a custom business rule or custom interface. But before we embark on any custom work, we always share our 25 years of experience, in case what has worked for others might work for you too. Take a Guided Tour to learn about best practices in Purchasing or better yet, let’s talk through your current procurement process to see if there are things that can be improved.